It’s hard to believe but it is now 30 years since the first issue of Ireland’s only archaeology magazine. We have been marking this significant milestone in a number of ways: by the development of the fully searchable digital archive and digital edition, launched earlier this year, and, at the end of September, with a one-day conference, ‘Answers from the ground: archaeological sites that have changed our view of Ireland’s past’, at Dublin Castle. The autumn issue of Archaeology Ireland also celebrates with a special feature, ‘Looking back and looking forward’, which considers in detail how much has changed in Irish archaeology over the last 30 years. Linzi Simpson examines how the contribution of developer-led archaeology has informed our understanding of medieval urban archaeology in Dublin. Michael Stanley considers how changes to archaeological policy and practice have helped ‘roads archaeology’ to transform our understanding of Ireland’s past. Colm Donnelly and Eileen Murphy reflect on three decades of archaeology in Northern Ireland, 1987–2017. Meriel McClatchie describes the development over the last 30 years of a vibrant area of research—environmental archaeology—and Gabriel Cooney takes a long view on archaeology and education, reviewing the changes over this period and arguing the need to take a much wider view of the nature and purpose of education in the specific context of archaeology. 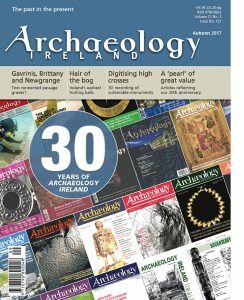 This big 30th birthday issue of Archaeology Ireland is also filled with news, book news, events and a wide range of articles. Clodagh Doyle from the Museum of Country Life examines Ireland’s earliest hurling balls, and in the ‘Know your Monuments’ series Muiris O’Sullivan and Liam Downey outline the evolution of hurling, Gaelic football and camogie (preview article available for free HERE). Gary Devlin and Rob Shaw of the Discovery Programme demonstrate the digital documentation of high crosses and describe the benefits of the detailed 3D recording of vulnerable monuments. Adding some seasoning to this special issue of Archaeology Ireland are two fascinating articles with a salty connection. Wes Forsythe, Rosemary McConkey and Colin Breen from the Centre for Maritime Archaeology at Ulster University describe the archaeology of salt-making, while Peter Harbison explores salt, sea and sealing in the possible connections between the passage tombs at Gavrinis in Brittany and Newgrange.